Why Is Gold Mining Such A Crappy Business? Below is an excerpt from a commentary originally posted at www.speculative-investor.com on 12th October 2014. That gold mining has generally been a crappy long-term investment for almost five decades is evidenced by the following chart. 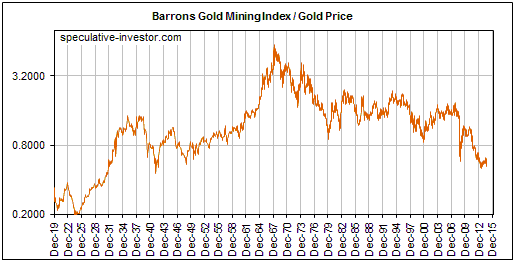 The chart, much of the data for which were provided by Nick Laird of www.sharelynx.com, shows the ratio of the Barrons Gold Mining Index (BGMI) and the US$ gold price from 1920 through to the present*. More specifically, it shows that, relative to gold bullion, the group of gold-mining stocks represented by the BGMI has been in a secular decline since 1968 and is now close to its lowest level since 1948. The question is: Why have gold mining stocks performed so poorly for so long relative to the metal? To answer the question we are going to draw on the Keynote speech recently delivered by Doug Pollitt of Pollitt & Co. at the Denver Gold Forum. A transcript of the speech can be read -- and should be read by anyone interested in gold mining investment -- HERE. This speech contains some eye-opening facts about the gold sector's operational performance and an important insight that, we think, explains why the gold-mining business has generated sub-par returns over a very long period. Hint: It isn't because the people who manage gold-mining businesses are, on average, dumber than the people who manage other commodity-production businesses. Before getting to the root cause of the problem it's worth emphasizing that the generally poor long-term performance of gold mining stocks stems from the generally poor long-term performance of gold mining businesses. In other words, although the swings in market sentiment are partly responsible for the swings in the BGMI/gold ratio shown in the above chart and although speculative sentiment towards gold mining is probably near a low ebb at this time, the lousy stock-market performance isn't primarily due to excessive pessimism on the part of share traders/investors. We are, after all, talking about a trend that has been in place for several decades, not something that just sprung up over the past two years. Instead, the lousy stock market performance is a rational response to the lousy returns generated by the underlying businesses. Currently, for example, with the gold-mining sector near its lowest level since 1948 relative to gold bullion, the stocks of most senior and mid-tier gold producers don't look cheap based on traditional measures of business health such as profitability and free-cash-flow generation. Two pieces of information from the above-linked speech highlight the poor performance of the gold-mining industry. We are referring to the charts labeled Figure 9 and Figure 10 on page 5. Figure 9 compares the retained earnings of the gold sector with the retained earnings of the oil and base-metals sectors, and indicates that over the past 15 years there were large increases in the retained earnings of oil and base-metal companies versus almost no increase in the retained earnings of gold-mining companies. This is despite a huge increase in the gold price. Figure 10 reveals that the production per share of the gold mining industry fell by about 35% over the same 15-year period while the production per share of the oil industry rose by about 30%. 1. Gold is the premier counter-cyclical asset. When the financial/banking system appears to be in trouble or it is widely feared that central banks are playing fast and loose with the official money, the stock and bond markets are perceived to be less attractive and gold-related investments are perceived to be more attractive. 2. Gold to the stock and bond markets is like an ant to an elephant, so the aforementioned shift in investment demand results in far more money making its way into gold-related investments than can be used efficiently. 3. Geology exacerbates the difficulty of putting a flood of new money to work in an efficient manner in the gold-mining industry, in that lucrative gold deposits are more difficult to find and are usually not as scalable as, for example, copper deposits, iron-ore deposits and oil deposits. By "not as scalable" it is meant that whereas a higher commodity price will often create an opportunity to expand an existing industrial-metals mine or oil-sands operation, that's usually not the case with a gold mine. 4. The new money flooding into the gold sector will be attracted to the companies showing the most growth. Due to the considerable amount of time, effort and risk involved in finding an economic gold deposit and then developing it into a mine, the quickest and easiest way to achieve the sort of growth for which the market brays is via M&A (mergers and acquisitions). However, whenever there is a surge in M&A activity, many of the purchases and business combinations will prove to be ill-conceived. Furthermore, the companies with solid cash-generating operations and high returns on investment that don't play the 'growth-at-any-cost-by-M&A' game will get swallowed by the companies that do. 5. The new money flooding into the gold sector will also tend to make large deposits more desirable, even if the deposits are in risky locations and are unlikely to ever be economic as a result of their low grades or problematic metallurgy. 6. Due to the issues noted above, the gold-mining sector experiences a lot more mal-investment than other commodity sectors. In the same way that the mal-investment fostered by the Fed's monetary inflation has caused the US economy to effectively stagnate over the past 15 years, the bad investment decisions fostered by the periodic floods of money towards gold mining have made the industry inefficient. Putting it another way, just as the busts that follow the central-bank-caused economic booms tend to wipe out all the gains made during the booms, the gold-mining industry experiences a boom-bust cycle of its own with similar results. The difference is that the booms in gold mining roughly coincide with the busts in the broad economy. 7. Not coincidentally, the problems for the gold-mining industry began at around the same time that central banks in general and the Federal Reserve in particular became free to inflate the money supply and manipulate interest rates without any rigid restrictions. The time was the early-1970s, when the US$ was untethered from gold. Gold producers have taken steps to become more efficient over the past 18 months and have liquidated many of the mal-investments of the preceding boom. This paves the way for dramatic strength in the shares relative to the bullion during at least the first year of the next bull market in gold-related investments, but it's a virtual certainty that the surging demand for gold during the coming economic bust will lead to yet another round of massive mal-investment in the gold-mining industry. The bottom line is that gold mining is doomed to remain a crappy business as long as the current monetary system is in place. This means that it will periodically be the recipient of a flood of new money, prompting a great deal of unproductive investment and TEMPORARILY generating huge returns for gold-stock investors. *The chart uses weekly data since 1960 and monthly data prior to 1960. Also, the chart uses BGMI data beginning in 1938 and the share price of Homestake Mining (HM) scaled to the BGMI prior to that.